The option to select specific wavelengths for a targeted plant response. A revolution in horticultural lighting is underway due to new developments in wavelength availability, light output, and energy conversion efficiency. The most likely the first recorded use of LED grow lights were by Bula et al. (1991) at the University of Wisconsin. The growth of lettuce plants under red LEDs supplemented with blue fluorescent (BF) lamps was equivalent to that under cool-white fluorescent (CWF) plus incandescent lamps. BF lamps were used as an alternative to blue LEDs, because blue LEDs were not widely available at the time. Soybeans [Glycine max (L.) Merr] (Zhou, 2005). A comparisons of red LED and xenonarc- illuminated kudzu [Pueraria lobate (Willd.) Ohwi] leaves showed slight differences in stomatal conductance (gS) but similar photosynthetic responses to photosynthetic photon flux (PPF) and CO2 (Tennessen et al., 1994). 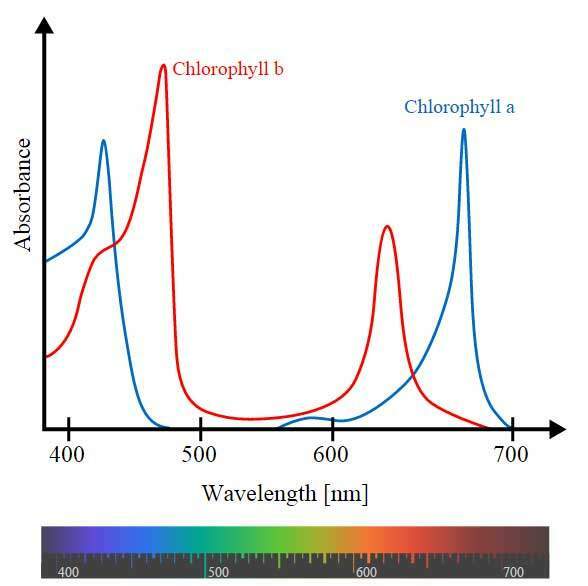 A comparison of photosynthetic rates of strawberry (Fragaria ·ananassa L.) leaves with red (660 nm) or blue (450 nm) LEDs showed higher quantum efficiencies under the reds (Yanagi et al., 1996a). Spectral measurements of red (660 nm) LEDs, red LEDs plus BF, red LEDs plus far-red (FR, 735 nm) LEDs, and metal halide (MH) lamps indicated similar phytochrome photostationary states but significantly higher levels of long-wave radiation from the MH lamps. Highlighting the thermal advantages of using LEDs in plant growth systems (Brown et al., 1995). Rice plants grown under a combination of red (660 nm) and blue (470 nm) LEDs sustained higher leaf photosynthetic rates than did leaves from plants grown under red LEDs only (Matsuda et al., 2004). The authors attributed this to higher nitrogen content of the blue light-supplemented plants. The figure above illustrates why specific wavelengths is the main reason LED grow lights are able to outperform other light sources. Far-red light, for example, is important for stimulating flowering of long-day plants (Deitzer et al., 1979; Downs, 1956) as well as for promoting internode elongation (Morgan and Smith, 1979). Blue light is important for phototropism (Blaauw and Blaauw-Jansen, 1970), for stomatal opening (Schwartz and Zeiger, 1984), and for inhibiting seedling growth on emergence of seedlings from a growth medium (Thomas and Dickinson, 1979). The blue light photoreceptor class of cryptochromes has been found to work in conjunction with the red/FR phytochrome photoreceptor class to control factors such as circadian rhythms and de-etiolation in plants (Devlin et al., 2007). The interactions are complex and continue to be unravelled at the molecular level (Devlin et al., 2007), but much of our understanding of these responses comes from studies with narrow-waveband lighting sources, in which LEDs provide obvious advantages. LED grow lights can be used to enhance desired characteristics for specific crops. In addition to changes in appearance and productivity, plant responses to narrow bandwidth light sources or to supplemental LED lighting show increased suppression of pathogens in tomato and cucumber (Kim et al., 2005 and references therein). This post was adapted from the article: Plant Productivity in Response to LED Lighting by Gioia D. Massa, Hyeon-Hye Kim, Raymond M. Wheeler and Cary A. Mitchell. Published in HORTSCIENCE VOL. 43(7) DECEMBER 2008. Bula, R.J., R.C. Morrow, T.W. Tibbitts, D.J. Barta, R.W. Ignatius, and T.S. Martin. 1991. Lightemitting diodes as a radiation source for plants. HortScience 26:203–205. Hoenecke, M.E., R.J. Bula, and T.W. Tibbitts. 1992. Importance of blue photon levels for lettuce seedlings grown under red-lightemitting diodes. HortScience 27:427–430. Barta, D.J., T.W. Tibbitts, R.J. Bula, and R.C. Morrow. 1992. Evaluation of light emitting diode characteristics for space-based plant irradiation source. Adv. Space Res. 12:141–149. Morrow, R.C., N.A. Duffie, T.W. Tibbitts, R.J. Bula, D.J. Barta, D.W. Ming, R.M. Wheeler, and D.M. Porterfield. 1995. Plant response in the ASTROCULTURE flight experiment unit. SAE Technical Paper 951624. Croxdale, J., M. Cook, T.W. Tibbitts, C.S. Brown, and R.M. Wheeler. 1997. Structure of potato tubers formed during spaceflight. J. Expt. Bot. 48:2037–2043. Stankovic, B., W. Zhou, and B.M. Link. 2002. Seed to seed growth of Arabidopsis thaliana on the International Space Station. SAE Technical Paper 2002-01-2284. Zhou, W. 2005. Advanced Astroculture plant growth unit: Capabilities and performances. SAE Technical Paper 2005-01-2840. Tennessen, D.J., R.L. Singsaas, and T.D. Sharkey. 1994. Light-emitting diodes as a light source for photosynthesis research. Photosynth. Res. 39:85–92. Yanagi, T., K. Okamoto, and S. Takita. 1996a. Effect of blue and red light intensity on photosynthetic rate of strawberry leaves. Acta Hort. 440:371–376. Brown, C.S., A.C. Schuerger, and J.C. Sager. 1995. Growth and photomorphogenesis of pepper plants grown under red light-emitting diodes supplemented with blue or far-red illumination. J. Amer. Soc. Hort. Sci. 120:808–813. light with or without supplemental blue light. Plant & Cell Physiol. 45:1870–1874. flowering in Wintex barley. Plant Physiol. 64:1015–1021. Downs, R.J. 1956. Photoreversibility of flower initiation. Plant Physiol. 31:279–284. Morgan, D.C. and H. Smith. 1979. A systematic relationship between phytochrome-controlled development and species habitat, for plants grown in simulated natural irradiation. Planta 145:253–258. Blaauw, O. and G. Blaauw-Jansen. 1970. The phototropic responses of Avena coleoptiles. Acta Botan. Neer. 19:755–763. Schwartz, A. and E. Zeiger. 1984. Metabolic energy for stomatal opening: Roles of photophosphorylation and oxidative phosphorylation. Planta 161:129–136. Thomas, B. and H.G. Dickinson. 1979. Evidence for two photoreceptors controlling growth in de-etiolated seedlings. Planta 146:545–550. Devlin, P.F., J.M. Christie, and M.J. Terry. 2007. Many hands make light work. J. Expt. Bot. 58:3071–3077. Kim, H.H., R.M. Wheeler, J.C. Sager, N.C. Yorio, and G.D. Goins. 2005. Light-emitting diodes as an illumination source for plants: A review of research at Kennedy Space Center. Habitation (Elmsford) 10:71–78. Previous post: Why Mars Hydro? Value for money!